To lose weight, you need to be selective with your carbohydrates. Glycemic load is a measure combining the amount of carbohydrates in food and their effect on blood-sugar levels. Foods that raise blood sugar also increase insulin levels, which, in turn, increase hunger. Thus, with low glycemic loads, you get your carbohydrates without the hunger. Whole-grain breads have all the nutritional value of the grain's kernel and relatively low glycemic loads. Whole-grain rye breads have some of the lowest glycemic loads among breads from around the world. Rye is in many ways like wheat, but it is more well-rounded as a source of protein and it is higher in fiber than wheat. As far as weight loss goes, fiber contributes to making food seem more satisfying, thus decreasing your appetite. High fiber has the added benefit of helping to stave off heart disease. Among all the grains, rye has the highest lignan content, and it is an excellent source of minerals, such as manganese and magnesium. Rye alone makes a very heavy bread, so wheat flour is usually mixed in to lighten it. The primary uses for barley are as animal feed and in beer making, but it is frequently used for baking in some countries. Barley bread usually has a very low glycemic load, similar to rye. Barley is also rich in fiber and lignans, and it is a great source of proteins and minerals, especially magnesium and selenium. 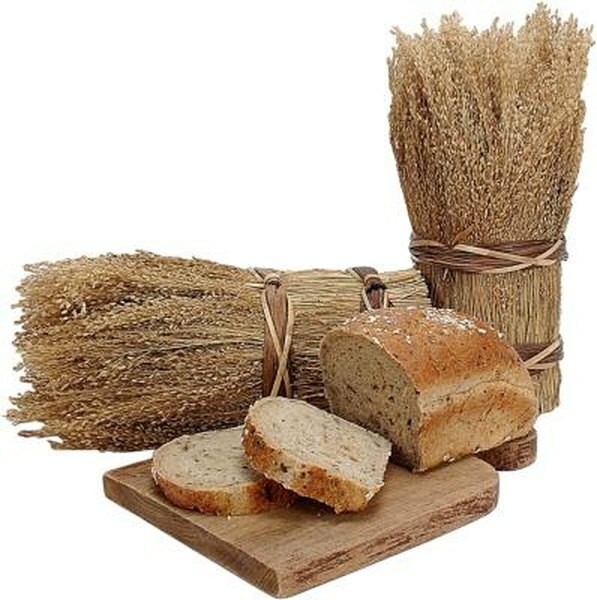 Rye and barley have relatively low gluten content, which is the protein responsible for bread's elastic-like structure. Without gluten, bread falls apart easier, so other flours are usually added when making barley bread. Wheat is easy to cultivate, nutritious, great tasting and high in gluten content, which makes it possible to produce light, fluffy loaves of bread. Although the proteins in wheat aren't as well-balanced as those in rye and barley, it is still an excellent source of protein and other minerals, such as manganese, phosphorus and magnesium. Whole-wheat bread is also high in fiber and has a low glycemic load. Using it as a substitute for less healthy sources of carbohydrates can help you lose weight. Like barley, the primary use for oats is animal feed and you have to remove the hull before eating them. However, oats are a nutritious source of dietary fiber and minerals, especially calcium, potassium and magnesium. Oats are similar to rye as far as having a well-balanced supply of proteins. Lysine, in particular, is a protein that many grains lack in sufficient quantity, but oats and rye are rich in it. Oat bread also has a low glycemic load, so it would also fit well in a weight-loss diet. Bake Info: What Happens Without Gluten in Bread?